You are all shooting great photos that you are happy with and proud of. The goal of this workshop is to give you the knowledge to be more consistent in hitting home run photographs every time you take your camera out of the bag. There are two parts to making an image, the technical side, and the artistic side. In one weekend, we will spend time teaching and helping you understand BOTH parts to making a great image, so you are more confident next time you’re ready to capture your home run image. We will spend a lot of time helping you understand how to operate your camera on FULL MANUAL. To do this, we will cover the technical aspects of photography; this will include F-stops, shutter speed, aperture, ISO, depth of field, lens choice, etc. Two people can be standing right next to each other, seeing the same scene in front of them, and in their head, they’ve made two very different images. Maybe you want to show the motion in the waves of Lake Michigan, having them be a blur in your image, while your friend would like to stop that motion, resulting in the waves being crisp and sharp. Because of this, we will teach people how to make better and quicker choices with their own cameras, to get the image they are feeling when they click the shutter button. The second part of the workshop will also focus on the art/vision side of photography and provide you with more choices/building blocks to create great art. For the 20/20 Vision portion of the workshop, we teach the 20 concepts we use everyday when building our own compositions. One thing we stress is that we build photographs, we don't take photographs. Before we click the shutter, we are thinking technically and artistically, to build the photograph in our head. Once we get an idea of the final image, we start setting up our tripod and begin building and composing the image. We then are able to click the shutter and see the image in our head come to life. We will help the most experienced shooters along with total beginners become more efficient and effective in building strong compositions. The weekend workshops are great for a total beginner with a new camera or a seasoned professional who is looking for a different perspective. All ages and abilities are welcomed. We will share all of our secrets on every aspect of our photography business and our secrets on how we shoot. We prefer you have a digital SLR. If you don’t, please have a camera that can be shot on full manual mode so you can change the aperture, shutter speed, and ISO. “Point and shoot” cameras and cell phone cameras are not recommended, as you will be limited in what manual options are available to you. By attending this workshop, you are eligible to attend all of the other advanced workshop options. The price of the Picture Perfect Weekend Workshops, including food and refreshments is $400. Lodging is not included. You may stay at the Cartier Mansion at their nightly rates if rooms are available or you may stay elsewhere. The Mansion fills up fast during these weekend workshops so the sooner you register the better your chances of getting the room you want. They offer a 20% discount for Workshop Students. The Cartier Mansion has the rooms blocked on their website, so please call them directly to book your room. 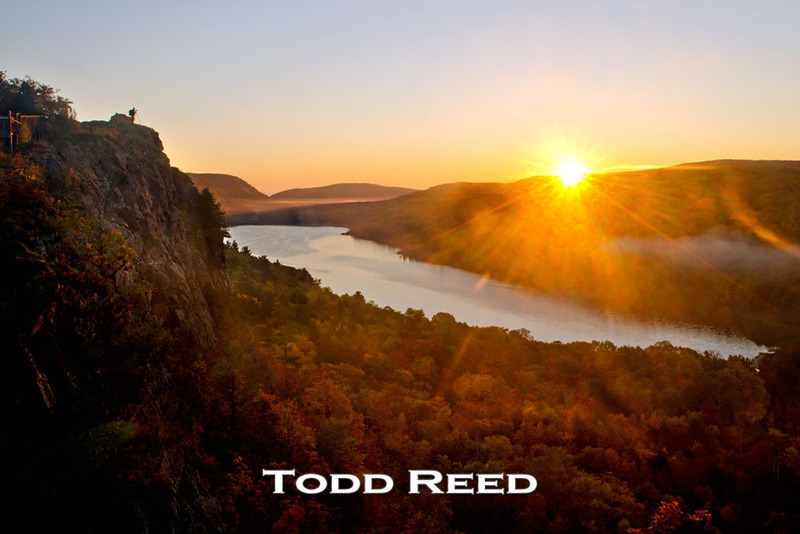 All registration and reservations are made through the Todd and Brad Reed Photography. Please call the gallery at 231-843-0777 to reserve your spot today. Payment is taken at the time of registration, 50% of which is nonrefundable. Cancellations must be made 30 days in advance of the workshop weekend to receive a 50% refund. Each workshop is limited to the first 15 people to sign up and must have a 10-person minimum. This 10-person minimum must be reached two weeks prior to the workshop. As the great black and white darkroom printer Fred Pickard once said, “A photograph is a very sensitive thing and everything affects everything!” After completing the Picture Perfect Weekend Workshop, you know how to control your camera on full manual and understand how to read your histogram to get a proper exposure, you are now ready to learn how to get the most out of your image in post processing. We will spend several hours showing you all our secrets in Adobe Photoshop and how we post process our own images. There are multiple ways to do the same move to an image in Adobe Photoshop and the program can be overwhelming and intimidating. We will show you a basic, straightforward, easy to follow digital workflow that you can take home and put to work on your own images. During the workshop, Todd and Brad will be using their laptop and projector to show you their process. The students won’t be using computers during this part of the workshop, just following along and asking questions. In the Advanced Weekend Workshop, Todd and Brad will also review the 20/20 Vision material for building stronger compositions, and you will have more shooting time in the field than in the Picture Perfect Weekend Workshop. This shooting time will give you the opportunity to put the knowledge you gained during that workshop, to good use. There will be a review of images taken by the students during the workshop, and a demonstration of some of the Photoshop techniques learned on with a few of the workshop participant’s photos. As with the Picture Perfect Weekend Workshops, all ages and abilities are welcomed. Any digital SLR camera is accepted, just bring your camera manual. The price of the Advanced Weekend Workshop, including food and refreshments is $400. Lodging is not included. You may stay at the Cartier Mansion at their nightly rates if rooms are available or you may stay elsewhere. The Mansion fills up fast during these weekend workshops so the sooner you register the better your chances of getting the room you want. They offer a 20% discount for Workshop Students. The Cartier Mansion has the rooms blocked on their website, so please call them directly to book your room. All registration and reservations are made through the Todd and Brad Reed Photography. Please call the gallery at 231-843-0777 to reserve your spot today. Payment is taken at the time of registration, 50% of which is nonrefundable. Cancellations must be made 30 days in advance of the workshop weekend to receive a 50% refund. Each workshop is limited to the first 15 people to sign up and must have a 10-person minimum. This 10-person minimum must be reached two weeks prior to the workshop. The Cartier Mansion is located at 409 E. Ludington Ave. in Ludington, MI 49431. Check them out at www.cartiermansion.com. Todd and Brad look forward to seeing you all again! Participants will stay at a beautiful home on the north side of Hamlin Lake. Each student will have their own bedroom and the house has several bathrooms as well. Lodging, all meals, and workshop fees are included in the price. The food is amazing and you won’t go away hungry! You will spend about 3 hours inside on the curriculum part of the workshop, but most of the workshop will be spent outside shooting along the Lake Michigan Shoreline and around Hamlin Lake. During the Picture Perfect Weekend Workshop you learned how to operate your camera on full manual, as well as how to utilize the 20/20 Vision concepts to compose your image. If you attended the Advanced Weekend Workshop, you were able to put those to work making more consistent homerun images. Now, Todd and Brad will walk you through the steps to Achieving Grade A Photographs by using The 4 Fs: Forethink, Feel, Focus, and Finish. After spending some time looking at and discussing sample images of Todd and Brad’s that help show these concepts, you will spend the majority of your time shooting sunsets and sunrises as well as looking for wildlife and putting the steps to Achieving Grade A Photographs to work! As Galen Rowell says, “Photography is an action sport”! Todd and Brad are excited for this workshop! We are limiting this workshop to the first SEVEN students that call to reserve their spot. These workshops fill up very quickly so call immediately to sign up. Please call 231-843-0777 to reserve your spot today! Payment of $795 is taken at the time of registration, and is non-refundable. This will include your lodging, meals, and workshop. *The lodging for this workshop has steep stairs, and during the workshop portion that is outside, you will be hiking and walking on sand, dunes, etc. Do you want an opportunity to photograph some of the largest whitetail deer in North America and other wiildlife? Do you want an executive chef to prepare world class food for you? Do you want to stay in a gorgoues lodge with beautiful accommodations? Then the Legends Ranch Photography Workshop by Todd and Brad Reed, located in Bitely, Michigan, is perfect for you!!!! From 3pm on Tuesday, through midmorning on Thursday, we will be hosting a photography workshop for the first 5 students that sign up and pay in full. With over 65 years of combined photographic experience, Todd and Brad Reed will help give you pointers on photographing wildlife and will help teach you how to be successful with your image making. Both Todd and Brad have won multiple international and national awards for their photographs and have helped thousands of workshop students become successful over the years. Todd and Brad pride themselves on not having any photographic secrets and sharing their knowledge with their students. Legends is a premier 2,000 acre high fence whitetail deer ranch located in the Northwest Lower Peninsula of Michigan that also has two large lakes on the property and numerous streams and swamps. Multiple world record bucks have come from Legends and we love to photograph them with our cameras. Now you have an opportunity to join us with your own camera to create your own visual masterpieces of these magnificent animals. Legends Ranch is teeming with other Michigan wildlife as well that you may get lucky to capture with your camera. We have photographed bald eagles, owls, hawks, song birds, swans, turkeys and woodpeckers to name just a few. You will be able to photograph the animals out of one of Legends Ranch’s many easily accessible blinds. Legends Ranch’s executive chef, and his highly trained staff, will serve us 5 different gourmet meals during the workshop with some of the finest beef, pork, cheese, wine and other specialties that are available anywhere. You won’t go away hungry, we promise! Each student will have a private bedroom with 5-star hotel quality amenities, including your own bathroom. The cost of the workshop is $1,500 per student and is non-refundable. Again, it is limited to the first 5 students that call the gallery at 231-843-0777 to sign up and pay in full. The gallery is open this time of year from 9:30am-5:30pm Monday through Saturday. Don’t miss out on this rare opportunity to explore the wonders of Legends Ranch with your cameras and learn from Todd and Brad Reed. We look forward to working with you soon! Description: Come join the father and son photography team of Todd and Brad Reed at a photography workshop at the Lake of the Clouds and the Presque Isle River in Michigan’s Upper Peninsula. Todd and Brad will take you into the beautiful Porcupine Mountains State Park and Bond Falls to help focus your vision on creating storytelling images that speak to YOUR heart. The Reeds will guide you through their steps in choosing imagery and designing their own award winning books. On Thursday of the workshop, each workshop student will gather their best images from the workshop shoots and will spend 2 hours of one on one time with Todd and Brad. During this time, the three of you will sit down at the Reed’s computer and they will help you choose your images and layout your own personal “Snapfish” type book. These books will be shipped directly to you once they are produced roughly 4 weeks after the workshop. Price: $2,500 for this special 5 day/4-night class. Workshop price covers lodging (each student has their own hotel room), instructional fees, picnic lunches out in the field and cost of the book and shipping. Students are responsible for their own transportation and remaining meals. *Non-participating attendees can also attend the workshop for an additional $200 charge. Their picnic lunches would be covered. These attendees are welcome along on any shooting adventures during the workshop. If they plan on shooting their own photographs, then we ask they be one of the 5 paying workshop students. We also ask that the classroom portions in the conference center be limited to registered workshop students. The last day we will all share photos made during this workshop, at this point, non-participants are welcome to join all of us in viewing these images. Lodging:AMERICINN SILVER CITY, Ontonagon, Michigan. We have already reserved all the rooms so you don’t have to worry about that, but you can check out the amenities at by clicking HERE. To reserve your spot in the workshop please call our Ludington gallery at 231-843-0777 to pay in full. The $2,500 is non-refundable except for extreme circumstances. Please email info@toddandbradreed.com for more information or to schedule a private lesson.